This post is a travel guide about Backpacking Kazakhstan with a 2 week Kazakhstan itinerary by train. This Kazakhstan itinerary and travel guide is based on my own experience backpacking in Kazakhstan in 2016 and 2019. I absolutely fell in love with Kazakhstan and I like to share my experiences with you. I will first explain why you should visit Kazakhstan including a short history. Then I will share my ultimate Kazakhstan itinerary and in the end all the practical information you need to know before you go backpacking Kazakhstan. Kazakhstan is a country that few people have heard about, but is the perfect backpackers destination. It’s the ninth biggest country in the world with lots of things to see and do for those that are interested in nature, history, train journeys and off the beaten path places. Honestly I didn’t know much about Kazakhstan either before I went the first time and that was maybe part of the appeal. All I knew was that it was a country of nomads with a grim Soviet past that was hard to get to. But the region is slowly opening its doors. Gone are the days of expensive visas, paperwork, bureaucracy and registrations with the local police. Most EU nationals no longer need a visa at all. Backpacking Kazakhstan is now easier than ever. There was not much information on the internet about backpacking in Kazakhstan back in 2016, but I was surprised by its diversity and how easy it was to travel around. I loved Kazakhstan so much that I came back a second time. Even though tourism is developing I was still left wondering how come people know so little of this huge country that has so much to offer for backpackers? Kazakhstan is the ninth biggest country in the world and besides some mountains in the south and east, most of the country are empty steppes and grass lands. There is no better way to get a true sense of the vastness of Kazakhstan than travelling by train. The distances are huge and the train journeys are long. The old Soviet trains are slow, but offer a nostalgic journey back to the good old days where in a few minutes you became friends with your fellow passengers who will share their food and vodka with you. If you have time on your hands this is still the way to go. But since a couple of years Kazakhstan introduced new high-speed trains from Spain. This reduces the train journeys between Nursultan (Astana), Almaty and Shymkent considerable from 20+ hours to comfortable nighttrain journeys between 13 – 16 hours. The Kazakh hospitality remains the same. I got my first sense of Kazakhstan’s ermptiness on the train journey from Nursultan (Astana) to Shymkent. The new high speed nighttrain was comfortable with 4 bunk beds in each cabin. I woke up to a desert landscape of endless flat grasslands with dried yellow grass. It continued for hours. During the whole journey we only stopped in 4 cities where we could go out to buy some food from old ladies selling pancakes and dried fish. Even though the landscape might get boring this will be well compensated by the interesting people you will meet. I shared my cabin with a russian couple and a young Kazakh girl with her one year old son. Word traveled fast and soon everyone in my part of the train knew there was a foreigner from ‘gollandiya’ on board. People were curious and passed by to take a look. Nobody spoke english, but with Google Translate they managed to ask me all kinds of questions. Why was I in Kazakhstan? Did I like their country? What kind of work did I do? Did I have brothers and sisters? Where was my husband? And then in shock, Why wasn’t I married yet? As we came near Shymkent the landscape became more interesting. The dry grass lands changed into green hills with the occasional river flowing through. We were close to the border with Kyrgyzstan and in the distance i could see the Tien Shan mountains. Snow was still on top of them. Despite the icy cold weather in Shymkent I got a warm welcome in my hostel where I was the only guest. Maybe not the only guest, because at night the mosquitoes kept me awake. I remembered reading something about them being plentiful in the kazakh steppes together with all kinds of other wildlife. Maybe the steppes are not so empty after all. Throughout it’s history the supposed emptiness of the steppes in Kazakhstan has been used for many things. Especially during the Soviet times Kazakhstan was used as the dustbin of the USSR. The so called gulags or working camps brought many political prisoners to the country where they were forced to work under austere conditions. Stalin even deported whole ethnic minorities such as the Chechens, Koreans and Volga Germans to Kazakhstan out of fear that they were not loyal enough to the regime. Famous persons like Trotsky and Dostoyevski all spent time in exile in Kazakhstan. The hospitality of the Kazakh nomads is impressive and could be a lesson for the world today. Many of those deported that chose to stay explain they could not have survived without the Kazakh people that helped them and taught them how to live in the harsh climates of the steppes. Kazakhstan was not only used to dump unwanted or suspicious persons. The Soviets also build their space launch program in Baikonur because of it’s isolation. The rhetoric was that with rocket debris falling from the air they would cause the least casualties in this empty space. As much as they were concerned about the lives of the Russians they were less so about the Kazakh nomads that were actually living on the steppes. Villages near Karaganda sometimes see rocket debris falling from the sky hoping it wont fall on their roofs. Another example is the area around Semipalatinsk that was used for Russia’s nuclear tests untill former president Nazarbayev put a stop to this in 1991. But even today the people are still suffering from the consequences due to increased rates of genetic mutations and cancers as can be seen in this article from National Geographic. My first trip I travelled for 3 weeks throughout the country making a circle from Nursultan (Astana) to Shymkent to Almaty and back. I started my journey in Nursultan (Astana). Former president Nazarbayev relocated the capital in 1997 to a small town in the north where he built a completely new city to show off Kazakhstan’s oil wealth. Whether you like the futuristic capital or not, it is an interesting start of any Kazakhstan itinerary. The capital will give you a better understanding of the country and it’s politics. Walking through the futuristic buildings is a surreal experience and the city has some interesting museums. I really liked Nursultan (Astana) and on my second visit saw how it is slowly developing its own unique atmosphere. It’s a young dymanic city with a developing cafe culture and a growing restaurant scene. Things to do: The biggest attraction in Nursultan (Astana) are the futuristic buildings along the 2 kilometer Nurzhol boulevard. Two days should be enough to get a good sense of the city including a visit to the older part of town and one or two museums. I can also recommend a visit to Alzhir in Malinovka. A former gulag from the Soviet times for the wives of political enemies of the state. It makes for an easy half day trip from Astana. Add an extra day to your Kazakhstan itinerary if you would like to visit the Borovoe National Park for beautiful lake Burabay or the Korghalzyn Nature Reserve. An important site for birdwatchers where you can spot pink flamengoes if you are lucky. Read more about Nursultan (Astana) in my post on the 20 Top things to do in Nursultan (Astana): Kazakhstan’s city of the future . 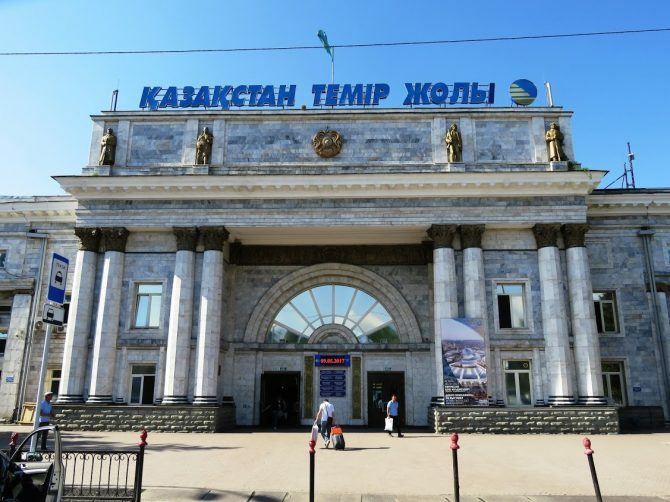 For onwards travel there are frequent trains to Karaganda and daily nighttrains to several places such as Shymkent, Almaty and Semey palatinsk. Karaganda is only 4 hours from Nursultan (Astana) and is an interesting stop if you travel from the capital to either Shymkent or Almaty. The city in the heart of the steppes was the centre of the coal mining industry during the Soviet Union. Stalin deported most Volga Germans to Karaganda and built a labour camp just outside the city for other political prisoners that came from all over the Soviet Union. Things to do: The main reason to visit Karaganda is the excellent Karlag museum in the former administration building of the labour camp in Dolinka. It’s an easy daytrip from Karaganda with frequent buses from Karaganda’s bus station to Dolinka. Karaganda itself does not have many things to do, but it is nice to walk around for an afternoon. I personally liked the city because of its Soviet murals on the buildings, quirky museums and monuments such as the Gagarin monument. How to get there: From Nursultan (Astana) there are frequent trains and marshrutka’s to Karaganda. For onward travel the high speed nighttrains from Nursultan (Astana) to Shymkent and Almaty also stop in Karaganda making it easy to to continue your journey to either city. Shymkent in the south was at the heart of Kazakhstan’s silk road and is an interesting city to learn more about Kazakhstan’s ancient history. The Southern region is also where the steppes end and the mountains begin. The perfect place for those that love nature and birdwatching. Things to do: Shymkent itself is a pleasant city for an easygoing day with a lively bazaar and plenty of parks to relax. The real beauty of the area lies outside of Shymkent though. On your second day I can recommend a daytrip to nearby Turkestan to see the beautiful mausoleum of Khoja Ahmed Yasaui. Shymkent is also a good place to explore Kazakhstan’s spectacular nature in the South. Add 2-3 extra days in your Kazakhstan itinerary for the Aksu Zhabagly National Park or the Sairam Ugam Nature Reserve where in spring you can see the wild tulips in bloom. Both are relatively easy to visit for backpackers with public transport connections and several homestay options. Read more about The best things to do in Shymkent and Turkestan: Kazakhstan’s Silk Road. How to get there: There are daily night trains from and to Nursultan (Astana) and Almaty. From Shymkent it is also easy to cross the border to Uzbekistan. There are direct buses between Shymkent and Tashkent (4 – 5 hours). Almaty is my favourite city in Kazakhstan. First of all, the city itself is fascinating. Its a city with a young population, but also one that still breathes it Soviet past. Even though it is no longer the capital of the country it remains the cultural heart of Kazakhstan. The second reason I love Almaty is that it is surrounded by the snow capped peaks of the Tien Shan mountains. From Almaty it is incredibly easy to explore some of Kazakhstan’s most spectacular nature. With the mountains at your doorstep Almaty is an outdoors paradise. Things to do: There are plenty of things to do in Almaty from the Panfilov park, the Zenkov cathedral, to the Arasan baths. While the city itself deserves 2 days to explore you can add several days to your Kazakhstan itinerary to get out into the mountains. You can make day trips to Big Almaty Lake, Chimbulak and to the Charyn Canyon. Kolsai Lakes was one of my highlights, but you need at least 2 or 3 days. Read more about the best of Almaty: the heart of Kazakhstan and Wild Kazakhstan: how to visit the Charyn Canyon and the Kolsai lakes. After Almaty you can also continue your journey to Kyrgyzstan. Bishkek is only 5 hours by bus from Almaty. If you have more than two weeks you are lucky and there are endless possibilities with so many beautiful places to visit in Kazakhstan. Consider the northeastern part of the country with the beautiful Altay mountains and the town of Semey Palatinsk that is known for the nuclear tests during the Soviet Union. Or visit the south western part of the country with the stone desert of Mangistau full of underground mosques and ancient necropolises. In central Kazakhstan you can visit the Karkaraly mountains or take the train from Aktobe to Kyzylorda and stop along in Baikonur and Aral to see what is left of the Aral sea. Kazakhstan has both the old Soviet style slow trains and new trains. If you have limited time the high speed trains are perfect allowing you to cross the huge distances at night. However, the high speed trains fill up quickly, especially in summer and during holidays. Therefore I can recommend to book your tickets online as soon as possible. How to book Kazakh train tickets online? I booked my tickets directly on the site of the Kazakh Railways. Before you needed a Kazakh credit card, but the site now also accepts international cards. Other reliable sites to book tickets online are TicketsKZ and Tutu. Of course you can also book tickets at the station itself, but chances are its sold out. Train classes in Kazakhstan: how to choose your seat? The slow trains have three classes. Platzkart has open wagons divided in compartments with 6 bunk beds. Kupe has seperate closed compartments with 4 beds and Lyux/SV is the most expensive with only 2 beds in a closed compartment. The option Obshye is a seat only and although it is cheapest it is best avoided on long overnight journeys. Platzkart is my preferred option, because it is the best way to meet people. The high speed trains also have three classes, but does not have platzkart. Tourist is the cheapest and is comparable with Kupe (4 beds in closed compartment). The more expensive Business has only 2 beds and Grand has an ensuite toilet and shower. I travelled in Tourist class and found it very comfortable. What to expect on a Kazakh train? The high speed trains all have a restaurant that serves decent food for decent prices. Each train wagon also has a water dispenser with both cold water and boiled water. Kazakh trains do not make a lot of stops, but at the stops you have local woman selling homemade products such as plov, blini’s and dried fish. Each wagon has an attendant that checks your ticket and passport. On overnight journeys they will provide you with sheets, a pillow and a blanket. There is a toilet with water basin at each end of the wagon. Hygiene varies a lot, but in general they get more dirty as the journey progresses. Despite the trains having a restaurant wagon it is a good idea to bring some food and snacks. People will often share their food with you and it is nice to be able to give something back. With the hot water dispenser you can make tea or noodles. Also bring toilet paper and wet wipes. Both Almaty and Nursultan (Astana) have two stations so check what station you depart or arrive from. Nursultan (Astana) ‘s old station (ASTANA – 1) is in the old part of town. The high speed trains arrive and depart from the newer Astana Nurly jol station near Mynzhyldyk alley. You can find more information about travelling by train in Kazakhstan on Caravanistan. For shorter trips and day trips from the cities marshrutkas are the way to go if you are backpacking Kazakhstan. The minivans leave once they are full and operate on demand. Malinovka, Borovoe, Dolinka, Turkestan, Aksu Zhabagly and Sayram Ugam are all possible to visit by marshrutka. Do keep in mind that most cities have multiple bus stations, each serving different destinations. Make sure you know which station you need to have. Marshrutka’s are a cheap way to travel. For example, a marshrutka from Shymkent to Tulkibas (for Aksu Zabagly) costs 500 tenge (as of Match 2019). For destinations where the demand is too low for marshrutka’s there are often shared taxi’s available. They too leave once they are full, unless you pay for the vacant seats. Depending on the time of the day and where you go taxi’s fill up quickly or test the limits of your patience. Shared taxi’s to a certain destination are often on a specific location in the city that might not be so obvious. Ask at your hostel to make sure you get to the right place. When negotiating the price make sure you want a shared taxi and not a private taxi. Drivers might encourage you to buy the other seats so that you can leave immediately. Depending on the price and how quickly the car fills up you can consider this or let the driver know you are happy to wait for other passengers. Hitchhiking is quite common in Kazakhstan and is a safe way to travel around for both travellers and locals. You will often see people at the side of the road waiting for a ride. Cars happily stop so they can share the costs of their fuel and any car can become a taxi this way. Therefore you should keep in mind that hitchhiking is not free in Kazakhstan. It is expected that you pay the driver something at the end and it would be rude not to. Renting a car is not the cheapest way to travel around in Kazakhstan and the distances are huge, but it will give you a lot of freedom. The main reason for considering to rent a car is that it will allow you to visit some of the more remote destinations in Kazakhstans spectacular nature. With public transport you are limited to the main cities and some of the easier day trips that you can make from them. By car, however, you can visit the Altay mountains, explore the Tien Shan mountains and other less known places like the Karkaraly mountains. The list of possible exciting destinations becomes endless if you have your own car. Yandex: the Russian version of uber also works in Kazakhstan. It is an easy way to order a taxi or get an idea of how much a taxi should cost on a certain route. Visiting Kazakhstan has become much easier in the recent years. Many nationalities no longer need a visa and for those who do things are much simpler than before. Check the latest visa requirements on the Kazakhstan visa guide on Caravanistan. Whether you need a visa or not, everyone does need to register with the police. This is done automatically if you fly into one of the international airports, but not if you cross the border over land. When you arrive in Kazakhstan you will get a migration card that is very important for you to keep with you. You need it again when you leave the country. If you get two stamps it means you are registered. If not, you can ask for a second stamp or register at the migration police. Registration should be free. The official languages in Kazakhstan are Kazakh (a Turkic language) and Russian using the Cyrillic script for both. English is rarely spoken, but with Google translate it is easy to get around. Even though it is not necessary, it will be useful to learn the Cyrillic script before you go. It is not too difficult and will be helpful in reading street names and place names. Kazakhstan has a mix of Russian and Central Asian cuisine. Beshbarmak is the national dish of Kazakhstan which is a noodle soup with horse meat. Other local dishes worth trying are plov (rice with carrot), laghman (noodle soup with vegetables), kuurdak (potato stew with meat), shaslyck (central asian kebab), manty (dumplings), baursaki (fried dough snacks) and samsa (samosa snacks). You can also try Kymyz (fermented horse milk) and Shubat (fermented camels milk). Horses and Kymyz are central to Kazakh culture and every year on the last saturday of may is the World Kymyz Muryndyk festival in Taraz. Bazaars and roadside cafe’s are a great place to try local food on a budget, but the menu is limited to central asian food like plov, laghman and shaslyck. Hygiene varies so look which places get the most customers to get the best and prevent getting sick. In the major cities you have plenty of choice between budget and mid range restaurants. Stolovaya’s are in the budget range and have a buffet with a wide range of salads, soups and meat dishes you can choose from. The quality ranges from mediocre lukewarm meals to surprisingly good. You can check my travel guides on Shymkent, Almaty and Astana for recommended restaurants. Kazakhstan uses the Kazakh Tenge. In Nursultan (Astana), Almaty and Shymkent there are enough ATM’s. You can also easily exchange Euro’s or dollars. Look for obmen valyuty for an exchange office. Once you go outside of the cities it is best to bring enough money with you in Kazakh tenge. Kazakhstan is not an expensive country per se. Public transport and local food in budget restaurants are extremely cheap. For example a meal in a budget restaurant costs around a 1000 or 2000 tenge and a marshrutka from Shymkent to Tulkibas is 500 tenge. However, tourism infrastructure is not well developed outside of the cities. Therefore visiting some of the more remote national parks such as the Altay mountains, the Charyn Canyon or the Kolsai Lakes are not that easy with public transport and requires tours that can add up to your budget. A pity, because Kazakhstan has such beautiful nature that is well worth the effort. Your Kazakhstan itinerary would not be complete without a trip into its mountains. Meet up with other people: Tour companies often let you pay per minivan with driver. This means that you can divide the costs per person and the more people, the cheaper the price. Hostels are a great place to meet with other travellers. Plan your trips in the weekends: Some tour companies offer shared trips in the weekends. These services are also used by expats and locals and therefore considerably cheaper. Almaty Backpackers Hostel has trips to Charyn Canyon and Kolsai Lakes and Qazway tours has daytrips to Borovoe NP in the weekends. Hitchhiking: Hitchhiking is quite common in Kazakhstan. It might require a bit more time and patience, but it would be much cheaper than a tour and an adventure in itself. Do keep in mind it is is not free and it is expected you pay something to the driver. Kazakhstan has a quite extreme climate. Winters are bitterly cold and summers unbearably hot. The best time to visit is spring and autumn. The end of March brings warmer temperatures and from the 21st of March till the 23rd of March is Nowruz. The new years spring festival celebrated in Iran and Central Asia. In April and May you can see the wild tulips in Aksu Zhabagly National Park and bird migrations in Korghalzyn National Park. During the summer from June till August it can get hot in Nursultan (Astana) and the steppes, but this is the perfect time to go trekking in the Tien Shan mountains near Almaty or the Altay mountains in the northeast of Kazakhstan. From September and early October temperatures go down, but the mountains are at its most beautiful with the autumn colours. Winter brings snow and opportunities for winter sports around Almaty. Is it safe to go backpacking Kazakhstan? Kazakhstan is a very safe country to travel in if you take the normal precautions. During my two trips backpacking in Kazakhstan I did not encounter any problems and people have always been very friendly and helpful, including authorities. Corruption is no longer as rampant as it used to be, but still a problem in Kazakhstan. However, as long as you are not breaking any laws, you are unlikely to be confronted with corruption as a tourist. Always carry your ID and in the rare case that the police stops you and does try to extort money pretend not to understand. Crime is not a big problem in Kazakhstan, although pickpocketing is not uncommon, especially in crowded places like bazaars. Keep your valuables safe and don’t flash around with expensive items. I travelled as a solo female traveller around the country for 3 weeks using public transport and trains. In my experience Kazakhstan is a very safe country for backpackers, whether you travel alone or not and whether you are male or female. Kazakhstan is a muslim country and even though most people identify with islam, they rarely follow strict religious rules. Kazakh people are very friendly and helpful towards travellers. If anything, they might be curious why you are traveling alone as a woman. That said it is better to dress modestly and make sure your shoulders and knees are covered, especially outside of the city where people are more conservative. This was a fascinating read for me. There’s so much valuable and interesting information in this report of yours. Thanks very much on behalf of all of us who’ve really benefited by reading it. I read it and just salivated about visiting this wonderful part of our planet. It’s been on my bucket list for years and reading your article reminded me of why it is near the top of my list. Your blog looks very cool. I look forward to reading thru it over the next few weeks. You seem to travel and see the world much as I do. That makes me feel good because my friends often joke with me because all the many places I travel to are not the usual places that they dream of going to LOL. So thanks for indirectly validating my off the beaten track mindset ;). I’ll stop writing here so I can go read a few more of your well written articles before bed. Keep up the great work. The world needs many more wonderfully genuine and passionate travellers like you. How neat! I did a train trip from Almaty to Moscow by train as a kid and it took 3 days (!) I’m not sure I’ll ever repeat that but I’d like to go back one day. High speed train of only 13-16 hours? Haha. Guest that beast 2 days. Kazaghstan looks very interesting and you gave good expression about the train ride gives an experience of the vastness.